Biopsy involves the surgical removal of a tissue specimen for histopathologic evaluation. Most intraocular tumors are reliably diagnosed based on the clinical evaluation or with noninvasive diagnostic techniques. However, accurately diagnosing a small percentage of tumors can be challenging. A tissue biopsy is thus needed to establish a definitive diagnosis and plan the requisite treatment. From fine-needle aspiration biopsy (FNAB) to surgical excision, all tissue collection techniques have been studied in the literature. Each technique has its indications and limitations. FNAB has been reported to provide for 88-95% reliable and safe ophthalmic tumor diagnosis and has gained popularity for prognostic purposes and providing eye conserving treatment surgeries. The technique and instrumentation for biopsy vary depending upon the tissue involved (retina, choroid, subretinal space, vitreous, and aqueous), suspected diagnosis, size, location, associated retinal detachment, and clarity of the media. The cytopathologist confers a very important role in diagnosis and their assistance plays a key role in managing and planning the treatment for malignancies. The diagnosis of a disease could be etiological, tissue based, or of molecular basis. Biopsy is the histopathological/cytopathological evaluation of a tissue specimen after its surgical removal-in part or in toto. The role of procuring a biopsy is to provide a diagnosis and to estimate the prognosis. The first intraocular biopsy was performed by Hirschberg in 1868. The techniques for intraocular biopsy have evolved over the years and serve to be imperative in the diagnosis and verification of malignant tumors before initiating any form of therapy. In this article, we will discuss the indications, techniques, complications, and limitations of biopsy for intraocular tumors. The main indication for intraocular tumor biopsy is when clinical examination and other investigations fail to establish an accurate diagnosis, e.g., tumor with atypical presentation, uveal metastasis with unknown primary tumor, or distinguishing a uveal melanoma from metastasis. It aids in determining the likely site of origin of ocular metastasis and in estimating the survival prognosis for the patient. The technique of obtaining a biopsy varies according to the site of the lesion involved. Biopsy techniques can be used for assessing both the anterior and the posterior segment tumors. 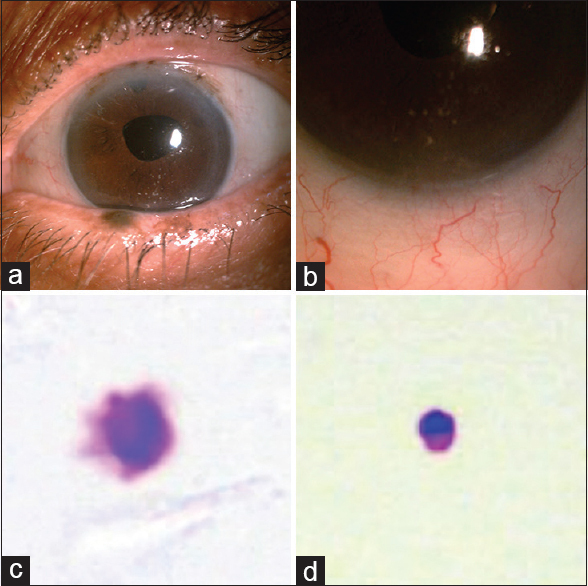 Aqueous tap can help in investigating neoplasms mimicking anterior uveitis or intraocular infections [Figure 2], e.g., multiple myeloma, intraocular lymphoma. In cases of suspected retinoblastoma, it should be employed with extreme caution to prevent extra-ocular spread. The ocular pathology laboratory is informed in advance, and the collected sample is immediately delivered to the laboratory. For adults, the procedure is done in the office with topical anesthesia (proparacaine 0.5%) and antibiotic cover (povidone-iodine 5%). The patient lies supine on the examination couch in the reclining position. The physician uses the illumination from indirect ophthalmoscope. This procedure can also be done on the slit-lamp microscope with the patient in an upright position. After cleaning the periocular skin with povidone-iodine, a sterile speculum is used to keep the lids apart. A 1 ml syringe mounted with a 30-gauge needle is used to gain entry into the anterior chamber at the limbus and aspirate about 0.2-0.3 ml of aqueous and cellular debris. The needle is withdrawn while placing a sterile cotton-tipped applicator at the point of insertion. Gentle pressure is applied for 10-20 s at the limbal site of entry. A sterile eye-patch is applied. Complications include lenticular injury, corneal tract abscess, endophthalmitis. The cellular yield from FNAB is often limited to a few cells and carries the risk of tissue injury with the sharp needle tip and edges. On the other hand, surgical iridectomy requires a corneal wound and sutures, with subsequent healing. The FIT is a minimally invasive technique that involves creating a clear-corneal, self-sealing, juxta-limbal, 1 mm incision with a microvitreoretinal (MVR) blade, preferably on the same side of the tumor. Anterior chamber is stabilized with sodium hyaluronate 1%. A 25-gauge aspiration biopsy cannula (vitrectomy probe) is inserted in the anterior chamber to (at least partially) occlude the tumor with the aspiration port. The aspiration cutting is done at a suction of 300 m Hg and a cutting rate of 600 cuts/min. The specimen is collected by placing the cutter port in balanced salt solution (BSS) and the aspirate is flushed into a 5 ml syringe for cytopathological evaluation. The potential complications are similar to iridectomy, but could also cause high IOP related to viscoelastic retention. FNAB is a novel technique for diagnosis and prognostication of ocular lesions. The technique depends upon the tissue involved, location, size, suspected diagnosis, and clarity of ocular media. Indications for FNAB include the following: Documented tumor growth or iris seeding with/without secondary glaucoma or multiple hyphema, to establish a tissue diagnosis before definitive treatment like enucleation or radiotherapy, presumed iris metastasis where systemic evaluation did not reveal a primary source. 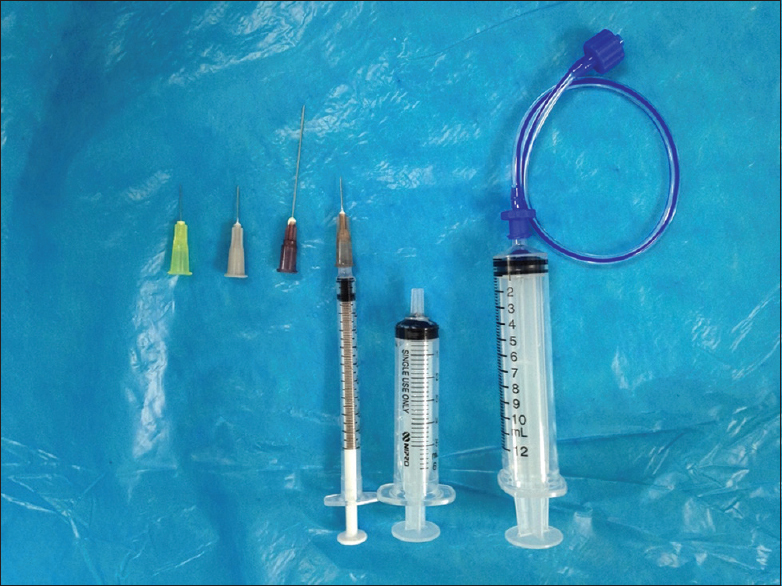 It involves using a 26-gauge needle attached to a straight polyethylene connector tubing of 12-20 inches long which is attached to 10 ml syringe [Figure 1]. The tubing prevents the transmission of small movements between the surgeon hands and syringe and thus provides stability. The length and volume of the tubing is important, as thin tubes provide higher resistance and large bore tubes provide inadequate suction. Tubing with elbows, clamps, filter, and joints are avoided because they obstruct, trap or dislodge cells. The length of tubing should be between 12 and 20 inches, as they provide an adequate surface area for cellular adhesion. Tubing with length <6 inches cause movement and interference with the needle tip in the eye. The three considerations before planning FNAB are globe site entry, trans-aqueous course and tumor aspiration point. Except for children, FNAB can be performed under local anesthesia, using an operating microscope and using limbus as the site of entry and avoiding conjunctiva. The FNAB can also be performed under slit-lamp visualization by using cornea and limbus as the site for entry. The site of entry is kept 90° from the meridian of tumor. After entering the anterior chamber, the needle is visualized with bevel side up and is passed through the aqueous parallel to the iris and into the tumor. The tumor aspiration point should be a relatively avascular site, at the thickest portion of the tumor, avoiding the lens. After securing entry into the tumor, gentle back and forth sliding motion of the needle along its trajectory within the mass is performed 3-4 times to loosen the cells for aspiration. Extreme care has to be taken while removing the needle so as to prevent anterior chamber flattening. The wound entry site is compressed with a gentle cotton tip applicator and intra-stromal hydration is done with BSS. The procedure involves achieving hypotensive anesthesia. The tumor is approached by partial thickness lamellar scleral resection and the tumor is removed along with deep scleral lamella along with the surrounding healthy choroid. 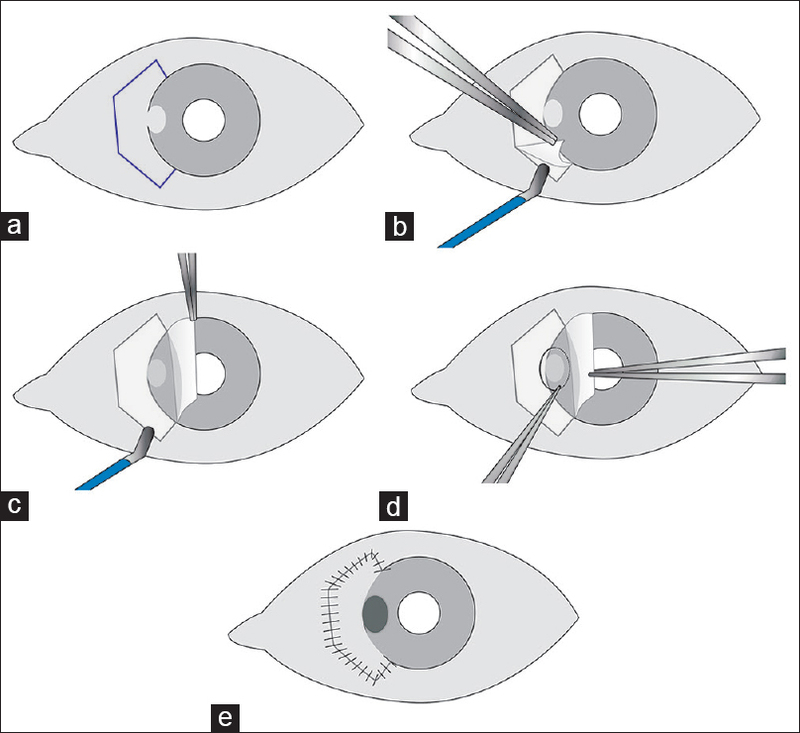 The surgical technique involves outlining a hinged scleral/corneoscleral flap [Figure 4]a that is dissected approximately 4 mm around the tumor [Figure 4]b and c. An incision is made through the inner scleral fibers around the tumor to expose the uveal tract [Figure 4]d and the tumor is removed along with the inner scleral fibers. The hinged scleral flap is resutured to its normal anatomic position [Figure 4]e. In the recent years, the technique has been modified by using pars plana vitrectomy and silicone oil in case of breach in retinal integrity. Vitrectomy aids in volume reduction of the eyeball and thus provides easy access to posteriorly located tumors, even those abutting the optic disc and prevents retinal prolapse during the scleral closure. 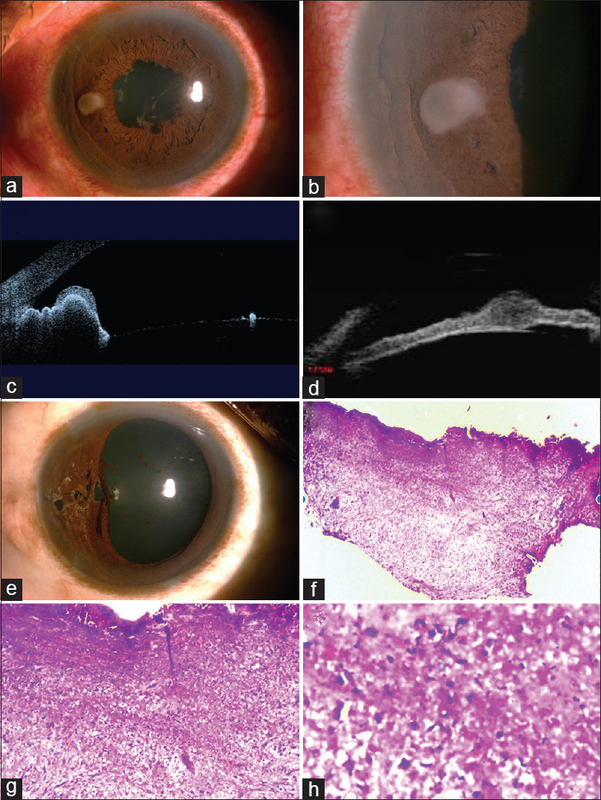 [Figure 5] depicts a case of CB-leiomyoma that was completely excised with PLSU using the trans-scleral approach. ,, Ramasubramanian et al. analyzed their results with this procedure in pediatric subjects, noting globe salvage in 65% and visual outcomes of 20/40 or better in 64%. The challenges to performing this procedure include large tumor basal dimension, posterior location of tumor, tumor seeding into anterior chamber or vitreous, patients needing anticoagulation, and the surgeon's perception of the procedure as too difficult or too time consuming. The trans-vitreal approach is performed by standard three-port pars plana vitrectomy using micro-incision vitrectomy system and valved cannulae. After core vitrectomy, posterior vitreous separation is induced and a complete vitrectomy is performed. This helps avoid vitreoretinal incarceration with the vitreous cutter during the biopsy. An appropriate site over the tumor is selected for its avascularity and height. The IOP is elevated and a retinotomy incision is made into the tumor with MVR blade to allow the transretinal entrance of the vitreous cutter. The vitreous cutter is impaled into the tumor at the chosen site and cutting is activated at a low-cutting rate of about 100 cuts/min taking 2-4 bites from the tumor. The tissue material is aspirated from the cutter into a 5 ml syringe. The cutter is carefully removed from the tumor and gently withdrawn out. The sample is promptly sent for cytopathologic examination. The IOP is slowly decreased to the normal level, thus avoiding bleeding from the biopsy site. Fluid/gas exchange is performed; the choice of endotamponade depending upon the location of the tumor and presence of sub-retinal fluid. Retinopexy may not be required in all cases. A watertight closure of scleral incisions can be achieved with 7-0 vicryl sutures. The complications associated with the procedure are vitreous hemorrhage, sub-retinal hemorrhage, and an inconclusive biopsy sample. The trans-scleral approach consists of making a 3-mm square scleral flap of 80% depth. A short 25-30-gauge needle is attached to a tubing. It is inserted through the scleral bed tangentially to obtain a sample. The scleral flaps are sutured. Young et al. conducted FNAB via trans-scleral approach for macular choroidal melanoma and concluded it to be a feasible technique for confirming the cytogenetic prognosis. The complications reported with the trans-scleral technique are retinal detachment, submacular, and vitreous hemorrhage. 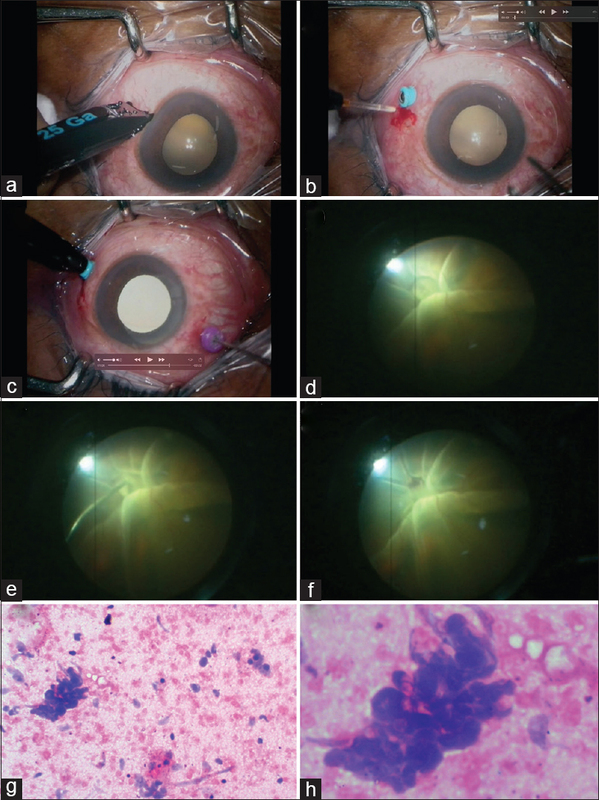 Methods to reduce potential systemic dissemination of tumor cells from the needle puncture site include application of cryotherapy or cotton-tipped applicator soaked with absolute alcohol at the scleral entry site. Among posterior segment tumors, FNAB is most commonly employed in reaching a diagnosis in eye with uveal melanoma, vitreoretinal lymphoma, and uveal metastasis. Retinoblastoma is a relative contraindication for FNAB because of the risk of seeding of the tumor outside the eye. The major limitations with FNAB are false negative and false positive results. Limited cellularity compromises the diagnostic potential of FNAB. A negative cytologic diagnosis should not be considered as an unequivocal proof for the absence of an intraocular malignancy. In order to optimize the positive yield from FNAB, one should avoid sampling small tumors (<2.5 mm in height), avoid using thinner needles, and rinse and flush the contents of the needle and syringe using a transport medium. Having an experienced cytopathologist handle, the biopsy material is essential. Improved instrumentation and newer modalities of ocular imaging have facilitated accurate diagnosis of intraocular tumors, making FNAB a gold standard in the diagnostic evaluation of most tumor lesions. Immediately after collection of the tumor samples, the tissue is submitted to the ophthalmic pathology laboratory for further processing or is alternatively processed depending upon the tissue collected and on-site availability of cytopathologist. Nowadays, immunohistochemistry (IHC) studies are routinely used for more precise classification and immunophenotyping of tumors. A close cooperation between the ophthalmic oncologist and the ophthalmic pathologist is essential because the tumor samples are usually very small and could easily be lost during processing. Cytopatholologist must interpret the cellular features within the clinical context. The role of tumor histopathology, cytogenetics, and gene expression profiling (GEP) in predicting the metastatic potential of uveal melanoma has been established. Hence, it is increasingly common to perform FNAB for prognostic purposes. Fluorescence in situ hybridization, single-nucleotide polymorphism array, and GEP are frequently employed to assess metastatic risk. Even though the diagnostic accuracy of intraocular biopsy is high, limited cellularity can compromise its diagnostic potential. The traditional biopsy techniques were limited by local tumor spread, in contrast to the FNAB technique, where inadequate sampling and cytopathologic interpretation are the major limitations. In the pars-plans vitrectomy technique, a limited three-port pars plana vitrectomy is performed that allows control over IOP and potential complications such as retinal/vitreous hemorrhage, retinal break formation, and retinal detachment. Given the possibility of limited cellularity with FNAB, negative cytologic diagnosis of malignancy should not be considered unequivocal proof of absence of intraocular malignancy. Subretinal hemorrhage localized to the site of biopsy and vitreous hemorrhage, are the most common complications. Applying pressure on the globe immediately after withdrawal of the needle is generally adequate to control the hemorrhage at biopsy site. These hemorrhages typically resolve within a few weeks. Intraocular tumor recurrence and retinal detachment are the other uncommon complications. Tumor seeding has been reported in an experimental setting after trans-vitreal and trans-scleral FNAB in enucleated tumor eyes. , The retinal break created when a subretinal tumor is biopsied transvitreally almost never leads to rhegmatogenous retinal detachment. The break is sealed by the blood clot at the biopsy site. Endophthalmitis following FNAB is extremely rare as the procedure is performed under sterile conditions. Biopsy for intraocular tumors is considered a safe method of tumor sampling with regard to tumor dissemination. However, inadequate sampling and cytopathologic interpretation are the major limitations for needle aspiration techniques. Long JC, Black WC, Danielson RW. Aspiration biopsy in intraocular tumors. AMA Arch Ophthalmol 1953;50:303-10. Sanders TE. Intraocular biopsy: An evaluation. Trans Am Ophthalmol Soc 1952;50:375-405. Eide N, Syrdalen P, Walaas L, Hagmar B. Fine needle aspiration biopsy in selecting treatment for inconclusive intraocular disease. Acta Ophthalmol Scand 1999;77:448-52. Finger PT, Latkany P, Kurli M, Iacob C. The Finger iridectomy technique: Small incision biopsy of anterior segment tumours. Br J Ophthalmol 2005;89:946-9. Marigo FA, Finger PT. Anterior segment tumors: Current concepts and innovations. Surv Ophthalmol 2003;48:569-93. Shields CL, Manquez ME, Ehya H, Mashayekhi A, Danzig CJ, Shields JA. Fine-needle aspiration biopsy of iris tumors in 100 consecutive cases: Technique and complications. Ophthalmology 2006;113:2080-6. Singh AD, Biscotti CV. Fine needle aspiration biopsy of ophthalmic tumors. Saudi J Ophthalmol 2012;26:117-23. Augsburger JJ. Fine needle aspiration biopsy of suspected metastatic cancers to the posterior uvea. Trans Am Ophthalmol Soc 1988;86:499-560. Foulds WS. The uses and limitations of intraocular biopsy. Eye (Lond) 1992;6(Pt 1):11-27. Shields JA, Shields CL, Shah P, Sivalingam V. Partial lamellar sclerouvectomy for ciliary body and choroidal tumors. Ophthalmology 1991;98:971-83. Shields CL, Shields JA. Surgical removal of intraocular tumors: Dismissing old wives' tales. Am J Ophthalmol 2013;156:3-4.e1. Ramasubramanian A, Shields CL, Kytasty C, Mahmood Z, Shah SU, Shields JA. Resection of intraocular tumors (partial lamellar sclerouvectomy) in the pediatric age group. Ophthalmology 2012;119:2507-13. Young TA, Burgess BL, Rao NP, Glasgow BJ, Straatsma BR. Transscleral fine-needle aspiration biopsy of macular choroidal melanoma. Am J Ophthalmol 2008;145:297-302. Cohen VM, Dinakaran S, Parsons MA, Rennie IG. Transvitreal fine needle aspiration biopsy: The influence of intraocular lesion size on diagnostic biopsy result. Eye (Lond) 2001;15(Pt 2):143-7. Bechrakis NE, Foerster MH, Bornfeld N. Biopsy in indeterminate intraocular tumors. Ophthalmology 2002;109:235-42. Jensen OA, Andersen SR. Late complications of biopsy in intraocular tumors. Acta Ophthalmol (Copenh) 1959;37:568-75. Sanders TE, Smith ME. Biopsy of intraocular tumors: A reevaluation. Int Ophthalmol Clin 1972;12:163-76. Glasgow BJ, Brown HH, Zargoza AM, Foos RY. Quantitation of tumor seeding from fine needle aspiration of ocular melanomas. Am J Ophthalmol 1988;105:538-46. 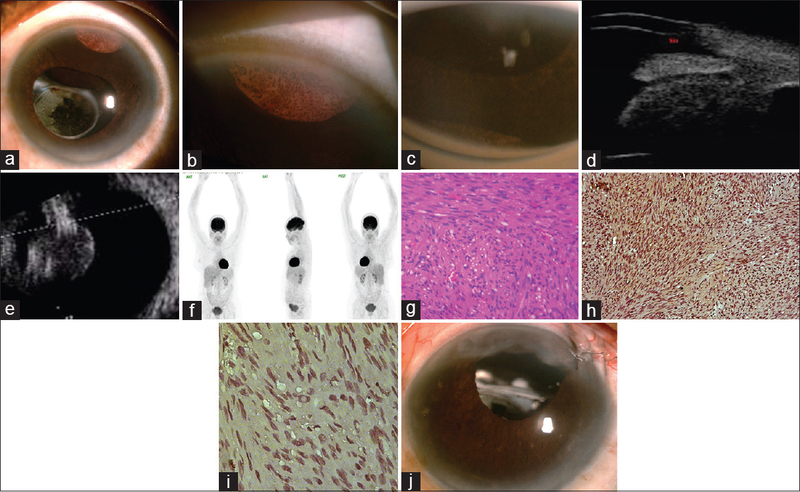 Shields JA, Shields CL, Ehya H, Eagle RC Jr., De Potter P. Fine-needle aspiration biopsy of suspected intraocular tumors. The 1992 Urwick Lecture. Ophthalmology 1993;100:1677-84. Augsburger JJ, Schneider S, Ehya H. The role of transvitreal fine needle aspiration biopsy in small suspected choroidal melanomas. Invest Ophthalmol Vis Sci 1999;40:1287. Singh AD, Pelages D, Zarate JO, Biscotti CV. FNAB of uveal melanoma with a graded prototype needle. ARVO Meet Abstr 2011;52:3270. Akgul H, Otterbach F, Bornfeld N, Jurklies B. Intraocular biopsy using special forceps: A new instrument and refined surgical technique. Br J Ophthalmol 2011;95:79-82. Karcioglu ZA, Gordon RA, Karcioglu GL. Tumor seeding in ocular fine needle aspiration biopsy. Ophthalmology 1985;92:1763-7.